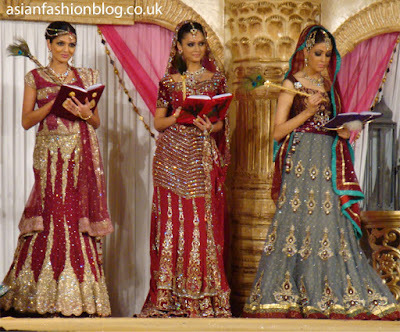 Harkirans closed the fashion show at the 2010 Birmingham Asiana Bridal Show, they also dressed the host of the show none other than Asiana Magazine editor Anisha Vasani. As far as I can remember, her outfit was the only sari to grace the catwalk that day, which doesn't really say very much for showing a variety of different outfits! I'm a big fan of the cream/green colour combination but not liking the embroidery at the bottom of the skirt so much. The red and grey colour scheme is quite unique, not something you see every day. I like the embroidery on this blue outfit. I can't quite figure out if the top is sleeveless and worn with a matching bolero jacket but I think it looks good either way. I'm not liking the big flowery design on the outfit below though, and what's with the second layer at the top of the skirt...maybe my photos just didn't catch what it should have looked like?! Unfortunately I didn't get any good photos of the show finale which included some western-style dresses, Harkirans have however uploaded some photos to their facebook fanpage which you see by clicking here. 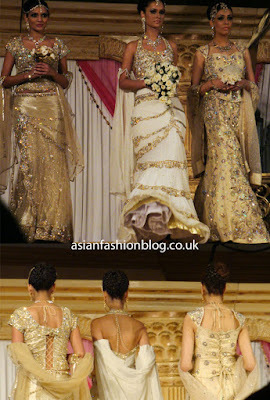 So that was all from the Birmingham Asiana Bridal Show 2010. 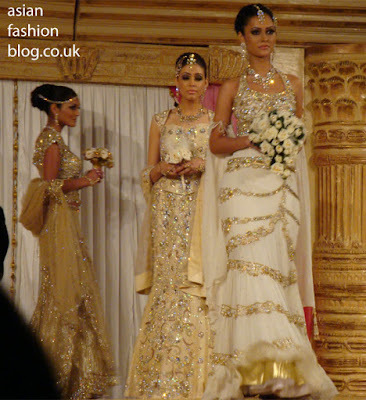 The London Asiana show is taking place this weekend and promises to be bigger and better, I won't be attending but if I come across any photos from the catwalk show I'll definitely post them for all to see! 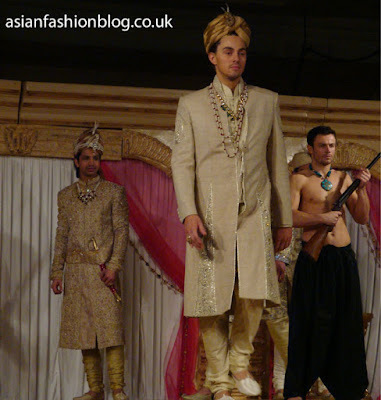 Ziggi Studio were the main menswear designer showcasing their collection at the Asiana Bridal show last weekend in Birmingham. 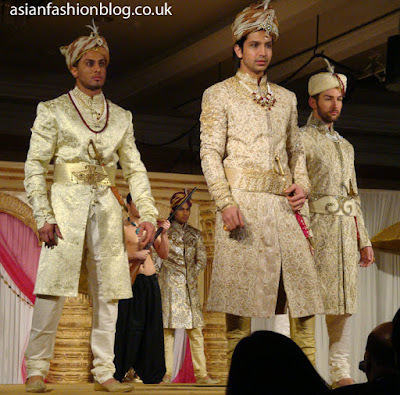 Now most asian wedding exhibitions throw in a bit of menswear into their catwalk shows as a token gesture (and it largely goes unnoticed compared to all the bridal outfits!) 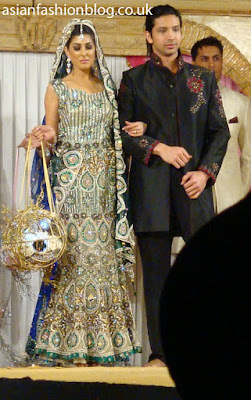 but this collection really stood out and made a statement! I got the chance to speak to Ziggi himself to find out more about this collection and where the inspiration came from for these regal outfits. After creating two modern contemporary sherwani collections which could be worn with jeans (Jaz Dhami wore a Ziggi Studio sherwani in his "Theke Wali" music video), they decided to take a different direction and design a collection of more traditional sherwanis for all the lucky grooms to be out there! These two outfits were the real stand-out pieces, both modelled by the 2010 face of Ziggi Studio, who will be appearing in all their ad campaigns. I really like the subtle detailing, such as the belt on the red outfit, and how if you look a little closer (click on each image to zoom) there's more than one shade of red on the fabric. The pearls and necklaces may be a bit too much for some grooms, but equally there are plenty of guys out there who like their bling! For grooms that aren't too adventorous with colours there was also an array of gold outfits, with intricate embroidery that looks good from far away and even better up close, all with their own little unique touches like the belts, collar details or pearl buttons on the sleeves. 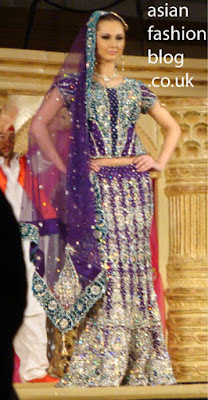 Ziggi came up with his ideas for this collection during a trip to India in 2005. 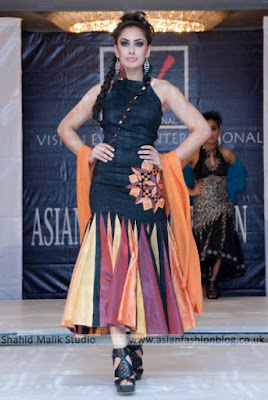 A fashion student at the time, he was inspired by ladieswear designer Kiran Khan and became very interested in the looks and style of the Mughal era. Of course this was a long time before films like Jodhaa Akbar came out and made that style fashionable again. So when the time came for him to launch his first collection, he put those ideas on hold (until now) and went for something modern instead, so that his work didn't get lost in all the movie imitations. This outfit I found quite interesting. Some might say it was boring in comparison to all the full on embroidery and shininess, but I like a designer who shows they can cater to different people's needs. I'd say this outfit would suit a more easy going type of groom who wants to look good but doesn't want to be weighed down too much. 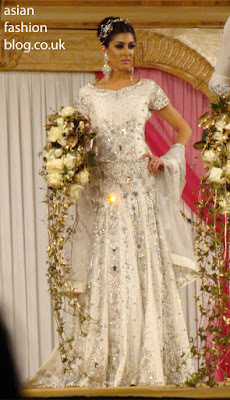 This outfit was my favourite, I'm just amazed by the effect the silver design on the gold fabric. Ziggi Studio opened their first retail store this week in Birmingham (you can find them on the first floor, 223 Ladypool Road), previously their collections were only available to private clients. 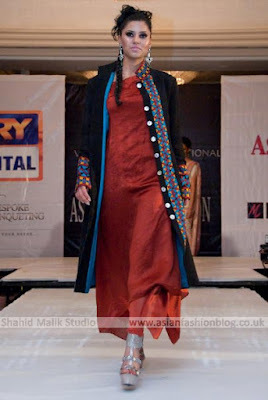 Prices started from £400 for the sherwanis and £80 for kurta tops. 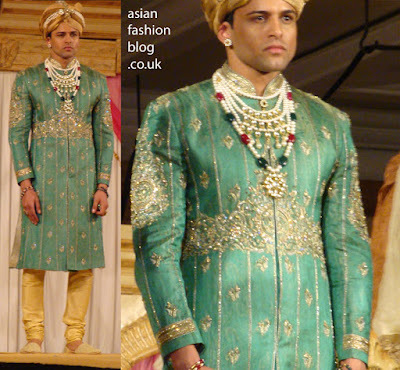 Before launching his range of menswear Ziggi worked as a stylist and photographer for Asiana Magazine so as well as getting a sherwani the chances are you can also get some tips on how to style the groom-to-be for the big day...and if you ask really nicely, maybe even some tips for styling the-bride-to be too! 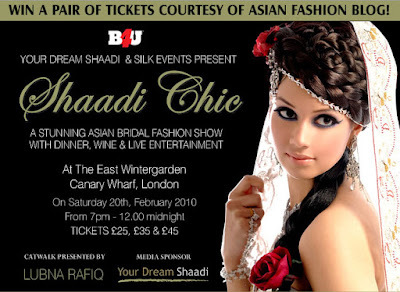 but before you ask - Ziggi Studio don't do ladieswear!! 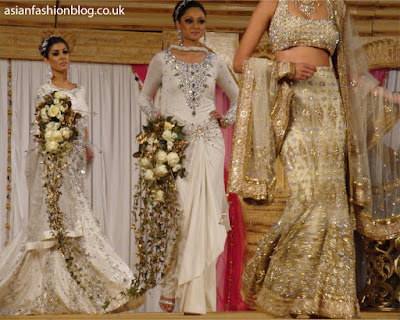 Opening the catwalk show at the Birmingham Asiana Bride Show 2010 was Khushboo's by Chand. Now whenever I mention this company, there always follows a stream of less than complementary comments and a few over the top with praise reviews too. I've personally never visited their store let alone bought anything so I can't say either way if they're good or bad. What I can say is that you shouldn't base your purchase decision solely on something you've read online (whether it be a positive or negative review! ), the best way to find out anything is to go and check them out in person for yourself! From your more traditional style tops above to teeny tiny bikini-style tops like the one below, there was a variety to suit most shades of modesty. I know I wouldn't wear the top below, but I do really like the skirt. There was also a lot of velvet from most of the designers, like the two outfits above. I haven't worn velvet in a very long time but having seen and touched some of the outfits up close, all I can say is velvet + embroidery = really heavy! They finished off their first part of the show with a traditional red outfit. 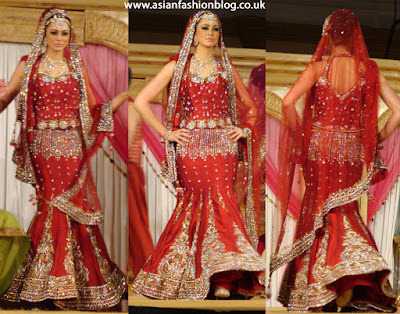 I really like the shape of the skirt and the embroidery - a simple design at the top and then more heavy work at the bottom. I think the shape of the back looks really pretty too with the little cut-out, it's perfect for accessorising with a mehndi design or stick-on gems.